During the summer months I always find myself reflecting on past family vacations. 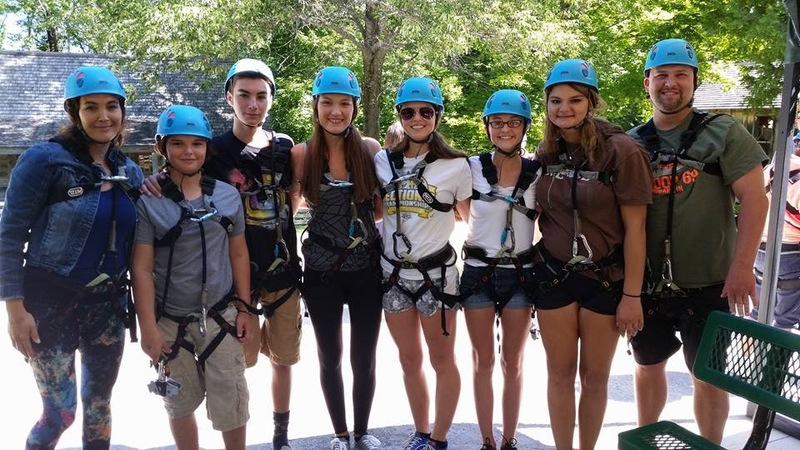 As a family, we’ve adventured into caves, zip lined through forests, bicycled around Mackinac Island, and went camping in the middle of nowhere. We’ve also experienced crazy storms, interesting bats, tons of horse poop, and a wild and crazy storm that left my husband and I soaking wet as we packed up our campsite. Looking back, some of our coolest memories are also some of our most bizarre. I believe that true growth happens when we venture outside of our comfort zone and try new and interesting things. And that has me thinking of the rock wall I almost didn’t climb. At some point during a past vacation my family decided that they wanted to climb a very high rock wall. (My husband is on the left in this pic and that brave woman to his right is ME!) It was way outside my comfort zone and half way up I wondered what I had been thinking. I was really scared. Like really really scared. A sudden surge of adrenaline and dare I say excitement kept me moving and I rang the little red bell at the top to announce my victory. As I scaled down the wall I felt a real sense of accomplishment. Not because I had climbed a rock wall while on vacation but because it felt so good to explore outside of my comfort zone. This picture serves as a fun reminder of all the possibilities that lie ahead. But what this picture doesn’t show is how easily it would have been to stay behind. To sit this one out. To make up some goofy excuse that would keep me on the ground and nowhere near the sweet satisfaction of ringing that victory bell. My fear of trying new things tells me that I may want to stay back at the hotel and binge watch the entire first season of The Crown but my inner wisdom whispers something else. My inner wisdom wants a voice. My inner wisdom knows how climbing one rock wall while on vacation will serve as a reminder that pretty cool and amazing things can happen when I step outside my comfort zone, feel the fear, and go for it anyway!